The Alberta Historical Resources Foundation awarded over one million dollars to assist 58 heritage projects. Through the Foundation’s Heritage Preservation Partnership Program, funding was approved for 52 projects to assist individuals, municipalities and organizations to preserve and interpret Alberta’s heritage. Project grant categories are: historic resource conservation, heritage awareness, publications and research, as well as the Roger Soderstrom Scholarship. 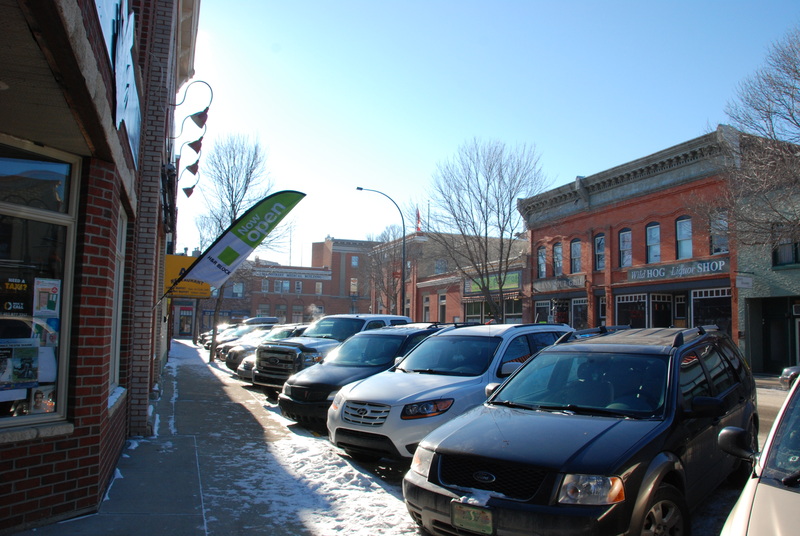 The Municipality of Crowsnest Pass has been awarded funding through the Municipal Heritage Partnership Program and the Town of Olds was awarded grants for projects through the Alberta Main Street Program. For a complete list of the funded projects, visit the Alberta Historical Resources Foundation‘s webpage. Did you enjoy our recent post On the Deep Roots of Beaver and Human Relationships in Alberta? Have we got exciting news for you. Todd Kristensen just told me that Nature Alberta will publish an expanded version of the article in the next issue of their quarterly magazine. 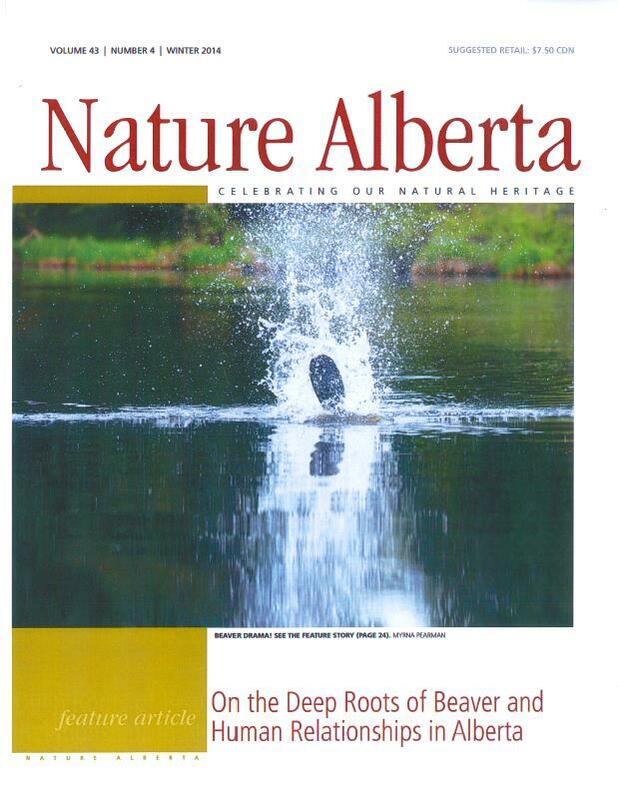 “On the Deep Roots of Beaver and Human Relationships in Alberta” will be the feature article in the Winter 2014 edition of Nature Alberta Magazine. It should hit news stands soon. You can also contact Nature Alberta directly to purchase a copy. Congratulations Todd and Heiz! Local leaders from Alberta Main Street Program communities met recently in Olds for information sharing, learning best practices, and ongoing conversations about the Four-Point Approach®. The program, established in 1987 and now renewed with a fresh format, revitalizes historic commercial areas through heritage conservation. The bar for participation is high: communities desiring to participate must complete a Heritage Inventory of their historic commercial area and commit to meet detailed standards of performance. Those in the Alberta Main Street Program network have met these high criteria and are committed to achieving excellence. 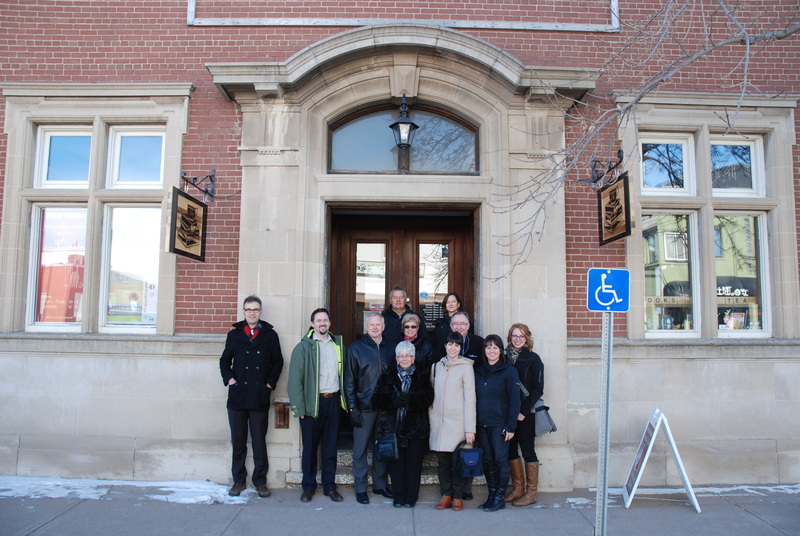 Alberta Main Street Program staff and Coordinators outside the Bank of Commerce Municipal Historic Resource in Olds. Back row, left to right: (Leon Durand, Chair, Uptowne Olds; Michelle Jorgensen, Town of Olds Heritage Advisor) Middle row, left to right: (Michael Thome, Municipal Heritage Services Officer; Matthew Francis, Manager, Municipal Heritage Services; Ted Stilson, Executive Director, Downtown Lethbridge BRZ; Carol-May Coty, Manager, City Centre Camrose; Ray Telford, City of Camrose Economic Development Officer; Ashley Stone, Program Director, Wainwright Buffalo Park Foundation. Front row, left to right: (Rita Thompson, Uptowne Olds; Rebecca Goodenough, Municipal Heritage Services Officer; and Debra Aitken, Uptowne Olds Coordinator). Alberta Main Street Program network members including Uptowne Olds, Downtown Lethbridge, City Centre Camrose, and Wainwright were represented at the coordinator’s meeting, the first in 2014. Fraser Shaw, Heritage Conservation Adviser with Alberta Culture, who served as the Main Street Coordinator in Ponoka and Black Diamond, delivered an informative presentation on quality design for historic Main Street communities. A key aspect of this is the area of historic signage: what is, and what is not, appropriate. While in the late 19th and early 20th centuries a “wild West” ethic probably prevailed, with “my sign is bigger than your sign” approach usually winning out, commercial areas today are governed by sign bylaws and other regulations. Can these bylaws take into account historic significance and character? The answer is a definite yes! – but implementation requires careful planning. The group learned that determining heritage values and understanding the historic area as a whole provides the basis to answering these kinds of questions. The afternoon learning session sparked many interesting questions and discussions among the Coordinators. Everyone left Olds energized and looking forward to the next quarterly Alberta Main Street Network meeting, which will take place in May. Written by: Matthew Francis, Manager of Municipal Heritage Services. This is the first of a series of articles introducing you to the staff of the Historic Resources Management Branch. We hope to give you a better sense what our staff does to protect, conserve and promote Alberta’s rich heritage. We begin by introducing you to our Executive Director. As Executive Director of the Historic Resources Management Branch, Matthew Wangler relishes the variety of his job, and the great range of historic resources he gets to learn about in depth—from quarrying sites used by First Nations peoples for thousands of years, to unassuming buildings embodying the history of one of Alberta’s most remarkable communities, to one of the world’s few meteorite craters holding surviving impact fragments (one of his favourites!). Matthew Wangler, busy at work. The Historic Resources Management Branch is charged with identifying, documenting, and protecting significant historic, archaeological, and palaeontological resources within Alberta. This is done through regulation of development that could impact such resources, along with education and consultation to help others (municipalities, property owners, community groups) to conserve or interpret their historic resources. This work is accomplished by three sections that Wangler oversees: Aboriginal Heritage, Archaeological Survey, and Historic Places Stewardship. Wangler reviews the major regulatory decisions of these sections. He is also directly involved in those large initiatives that involve other ministries. One such task has been working to develop the recently announced flood relief funding programs. In addition, Wangler is Executive Director of the Alberta Historical Resources Foundation. In that role he provides support to activities of the Foundation’s board, including its quarterly meetings, and he helps to ensure that funding decisions are implemented. For instance, several years ago, City of Calgary staff alerted the Historic Resources Management Branch that a demolition application had been filed for a portion of the Calgary Brewing and Malting Company—an early and major employer that was highly influential in the development of Calgary and the region. The department responded by requiring the owner to produce a Historic Resources Impact Assessment. Such requirements can buy time to educate property owners about the historical significance of their sites and the potential financial, environmental, and visitor-appeal benefits of conserving them appropriately. It also gives municipal planners time to propose conservation-friendly development alternatives. In fact, lack of widespread awareness about Alberta’s heritage resources and the value of conservation is among Wangler’s most pressing concerns. Part of the problem is that the value of much of the work of the Historic Resources Branch may not be immediately apparent to the public, although the artifacts and fossils that are recovered, the historic buildings that are saved and reused, and the cultural sites of significance to Aboriginal communities that are preserved contribute to a range of social, economic, and cultural outcomes. “But the solution is quite simple!” Wangler continues. He’s eager for his staff to engage in greater public outreach—writing blog posts, visiting school classrooms, speaking at public events—to build awareness of Alberta’s diverse heritage resources and the opportunities they offer. This post continues our look at the work of Alberta’s Archaeological Survey. Previously, we explored “10, 000 years of hunting in Alberta”, as shown in the archaeological record and how the horse changed the west. Today we look at that Canadian icon: the Beaver. There are few animals in the north whose history is so intricately interwoven with people than the beaver. From the early fur trade to modern environmentalism, the beaver has chewed its way into numerous facets of life in Alberta. Paleontology, archaeology, history, and modern politics combine to tell an amazing story of human-beaver relationships in the province. The earliest beavers lumbered into the province over five million years ago. 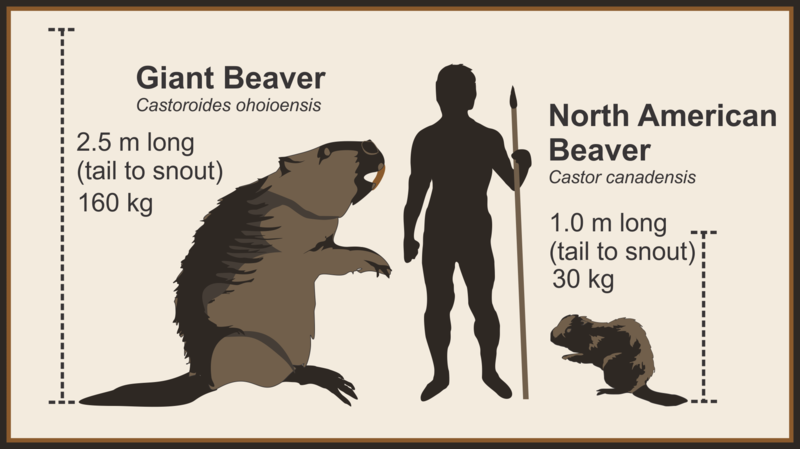 By two million years ago, the modern beaver (Castor canadensis) was living alongside a colossal cousin that was five to six times larger (Figure 1). The giant beaver (C. ohioensis) weighed up to 160 kilogram and was just under 3 metres long. It went extinct around 10 000 years ago. First Nations’ stories tell of the beaver’s role in creating the world by molding the primordial mud into an island fit for humans. To Alberta’s first people, beavers also furnished important materials for tools, clothing, and food. Archaeology sites across the province have yielded beaver bones where very few other animal remains were found. This indicates that beavers were crucial to human diet, particularly during winter. Beavers were captured with willow bark nets, stone-tipped spears, and sinew snares set along beaver trails and canals. Figure 1: Beaver scale comparison (by Todd Kristensen). Three major anatomical traits made the beaver important to various cultures in Alberta through history. Beavers stay warm with large fat deposits and very dense, barbed hair. The former trait explained why beavers were important winter foods while the latter trait fueled the fur trade that shaped our nation. The third important trait is durable teeth that enable beaver’s incessant chewing. When it came time to design wood working tools, prehistoric people enlisted the beaver’s dental assistance. Ancient engravers and chisels were made of beaver teeth lashed to a wooden handle. Beaver tooth engravers were common in the toolbox of early northern people and provide a unique glimpse in to the ingenuity of First Nations. Figure 4: Beaver hat fashions during the fur trade (by Terry Pamplin and Todd Kristensen). The strong, oily, and barbed under-hairs of beaver were ideal for making superb quality felt hats that were popular from the late 1500s-1800s (Figure 4). Prior to European contact there were likely over 10 million beaver in Canada. These vast numbers were an economic ‘boon’ for Europeans, but the abundance was short-lived. Beaver populations were reduced by as much as 95% in two centuries. As each new fur trade post was established on Alberta’s lakes and rivers, a zone of beaver depletion rapidly radiated outwards until local numbers dwindled and the traders moved on. Fur trade competition decreased in the 1820s and areas of the Canadian northwest were managed more judiciously so that beaver populations recovered and future crashes were prevented. Despite lower populations, hundreds of thousands of beaver pelts and over 10 tons of castoreum (a highly fragrant secretion produced in beaver castor sacs) were shipped out of the Athabasca and Saskatchewan River Districts in the early 1800s. Biologists like Dr. Glynnis Hood of the University of Alberta, are researching the ecological impact of the fur trade and modern beaver dams. They’ve found that beavers drastically alter local water levels as well as wetland biodiversity, fire regimes, floods, carbon sequestering, and the filtering of local toxins. 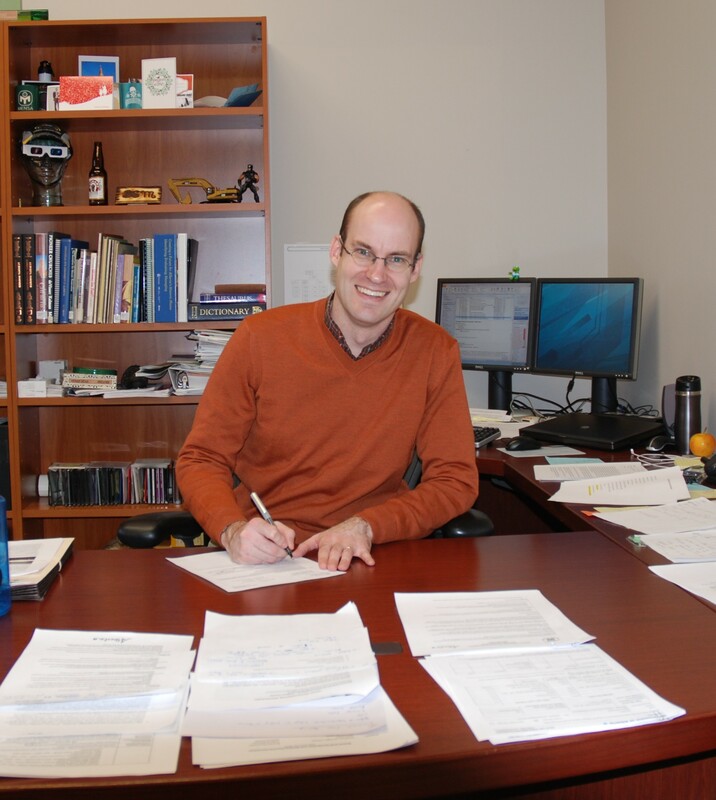 Dr. Hood’s research explores how knowledge of the beavers’ aquatic engineering can inform land management decisions. The esteemed human-like propensity for industrious labour earned the beaver the honour of our national animal and it may become a tool to mitigate future climatic oscillations (e.g., droughts and floods). Beaver teeth, winter fat, and dense fur represent biological adaptations that early Albertans exploited to suit their needs; dam building may be the latest trait that Albertans utilize in their ever evolving relationship with beavers. Written by: Todd Kristensen, Northern Archaeologist & Heinz Pyszczyk, Archaeologist. UPDATE: Nature Alberta will publish an expanded version of this article in their quarterly magazine. In fact, “On the Deep Roots of Beaver and Human Relationships in Alberta” is the feature article in the Winter 2014 edition of Nature Alberta Magazine. Congratulations Todd and Heiz. –Michael Thome, editor. Municipal Heritage Forum 2014—Save the Date! Every year, the Historic Resources Management Branch organises a conference for Albertans involved in identifying, protecting or conserving historic places at the municipal level. We’re please to announce that the 2014 Municipal Heritage Forum will be held on October 16th and 17th. We are excited to host this year’s forum in a municipality we haven’t held it in yet. Many of you haven’t been here (yet) and will be delighted by their conservation ethic. I’ve posted some pictures of their historic downtown. Can you guess where the forum will be this year? Post your guess in the comment section, on our Facebook page or tweet us. UPDATE: I guess the cat’s out of the bag: we plan to hold the 2014 Municipal Heritage Forum in the City of Lacombe. This is the first installment of a new series of blog posts on RETROactive entitled New Uses for Old Places. We will be highlighting examples from around Alberta of historic resources that have found interesting, new uses for spaces that were originally designed for different purposes. To start us off we are going to talk about the ubiquitous warehouse conversion. One of the best ways to ensure a long and prosperous future for a historic place is to make sure that it is in use. Making certain that people are frequenting a site ensures that a historic resource stays relevant and in the forefront of public consciousness. This can be a challenge given that the purposes for which many of our historic places were originally designed for are now defunct. The conversion of a building to allow for a new use is known as adaptive reuse and it is a process that can require some creative thinking. The values-based approach to heritage conservation recognizes the importance of activating our historic places and recognizes that alterations may be required to ensure the long-term sustainability of a site. The Standards and Guidelines for the Conservation of Historic Places in Canada consider adaptive reuse to be a rehabilitation conservation treatment. Rehabilitation is understood to be “the sensitive adaptation of an historic place or individual component for a continuing or compatible contemporary use, while protecting its heritage value” (Standards & Guidelines, page 16). A popular form of adaptive reuse/rehabilitation is that of the warehouse conversion. More common in larger cities that once were home to warehousing and manufacturing sectors, warehouse districts are now often surrounded by non-industrial, higher density development and attract investors who see the potential in the character that the former industrial spaces have to offer. Warehouses make good candidates for adaptive reuse because they have large, relatively open floor plates, generous ceiling heights and numerous large windows. These features allow for the flexibility to subdivide the interior space for a variety of purposes without compromising the unique elements that make warehouses so charming (think freight elevators, bank vaults, exposed beams, etc.). Edmonton and Calgary were home to the majority of manufacturing and shipping in Alberta. As such the majority of extant warehouse structures are located in these two cities, though there are others scattered in other communities across the province. 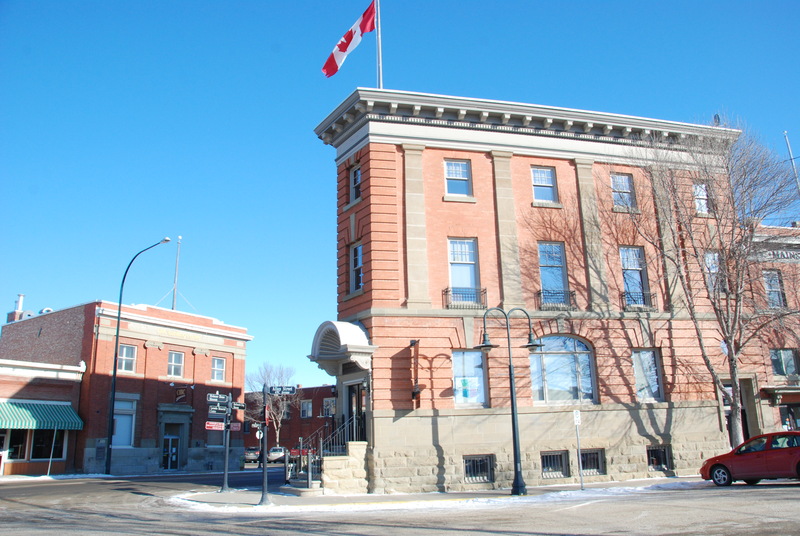 A number of these structures have received historical designation at the municipal and/or provincial level and have been rehabilitated to accommodate a variety of new uses.